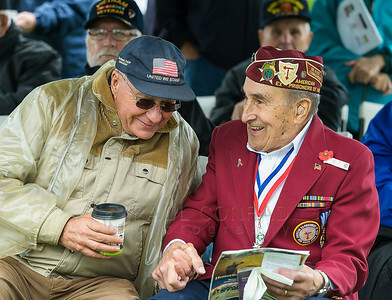 © Paul Conrad/The Bellingham Herald - World War 2 veterans Bob Van Weerdhuizen, left, and Joe Moser share memories before the start of the 50th annual Festival of Flags and Remembrance Ceremony at Greenacres Memorial Park in Ferndale, Wash., on Monday afternoon May 25, 2015. Moser was one of this years honorees. 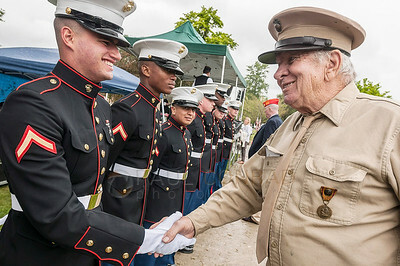 © Paul Conrad/The Bellingham Herald - “The old and the new, that’s what we are” says World War II veteran Bob Lemke of Bellingham, right, as he shakes hands with Pfc. 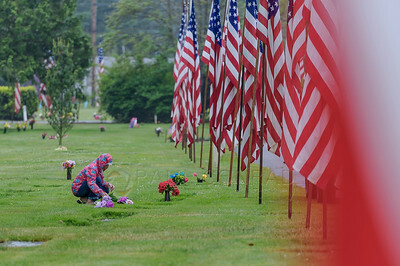 Matthew Montanez during the 50th annual Festival of Flags and Remembrance Ceremony at Greenacres Memorial Park in Ferndale, Wash., on Monday afternoon May 25, 2015. Lemke served with the 1st Marines in China and says he was "17 years and one week old" when he enlisted. 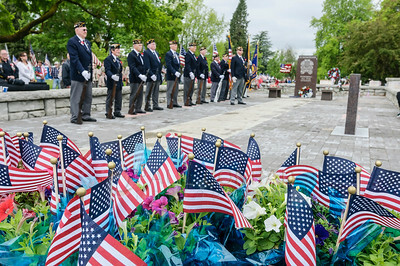 © Paul Conrad/The Bellingham Herald - SSgt. 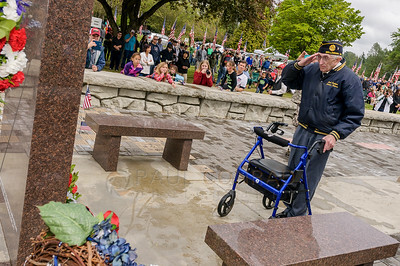 Scott Rauch of Bellingham, holds a folded U.S. flag proior to the official flag raising during the 50th annual Festival of Flags and Remembrance Ceremony at Greenacres Memorial Park in Ferndale, Wash., on Monday afternoon May 25, 2015. SSgt. Rauch says he is with the 133d Army Band. 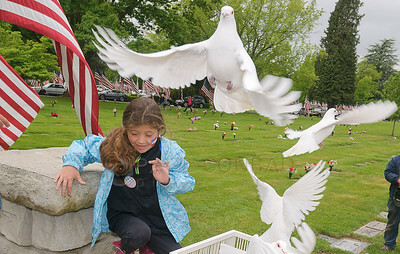 © Paul Conrad/The Bellingham Herald - Emily Borbon, 7, of Bellingham gets surrounded by doves during the 50th annual Festival of Flags and Remembrance Ceremony at Greenacres Memorial Park in Ferndale, Wash., on Monday afternoon May 25, 2015. The Thunder Birds 4H Club and Flights of Fancy provided doves for the ceremony. 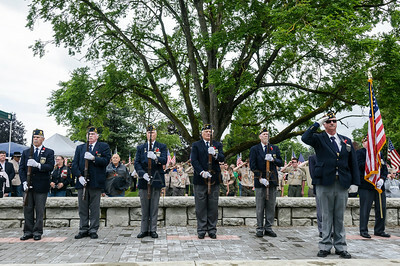 © Paul Conrad/The Bellingham Herald - Eagle Scout Matthew Klein of Bellingham unveils the new WWII Monument during the 50th annual Festival of Flags and Remembrance Ceremony at Greenacres Memorial Park in Ferndale, Wash., on Monday afternoon May 25, 2015. 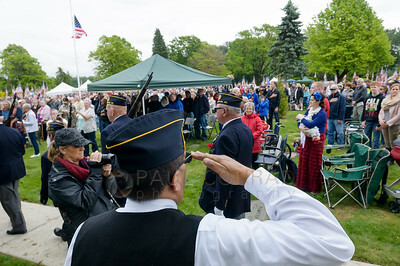 © Paul Conrad/The Bellingham Herald - After begin escorted by Pfc. 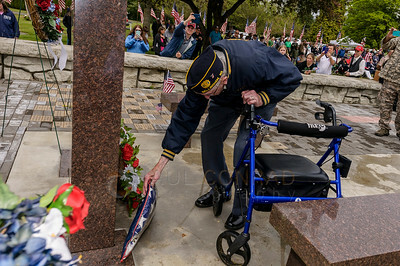 Krisitan Samuels, Jeff Ewing lays a flower at the Veteran's Memorial during the 50th annual Festival of Flags and Remembrance Ceremony at Greenacres Memorial Park in Ferndale, Wash., on Monday afternoon May 25, 2015. Ewing says his brother Ronald and uncle Robert Ewing, both Army veterans, died this year, making this Memorial Day especially difficult. 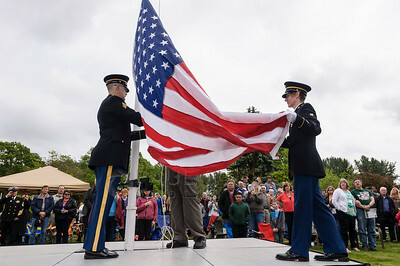 © Paul Conrad/The Bellingham Herald - Images from the 50th annual Festival of Flags and Rememberance Ceremony at Greenacres Memorial Park in Ferndale, Wash., on Monday afternoon May 25, 2015. 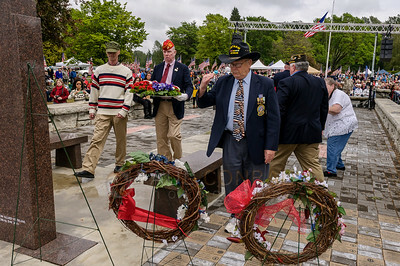 © Paul Conrad/The Bellingham Herald - (l to r) SSgt. 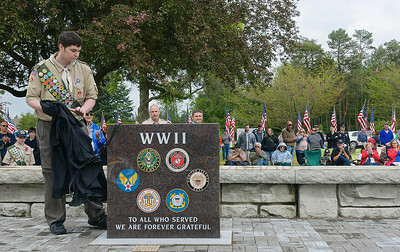 Scott Rauch of Bellingham, Eagle Scout Matthew Klein, and Spc. 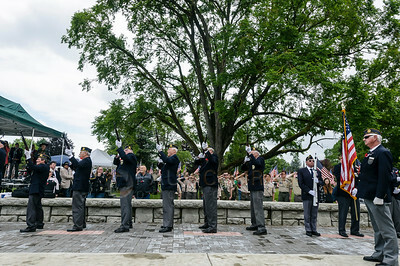 Daw Rauch raise the flag during the 50th annual Festival of Flags and Remembrance Ceremony at Greenacres Memorial Park in Ferndale, Wash., on Monday afternoon May 25, 2015. 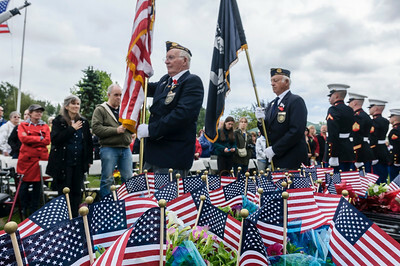 © Paul Conrad/The Bellingham Herald - American Legion Post 7 file past after competing their duties during the 50th annual Festival of Flags and Remembrance Ceremony at Greenacres Memorial Park in Ferndale, Wash., on Monday afternoon May 25, 2015. 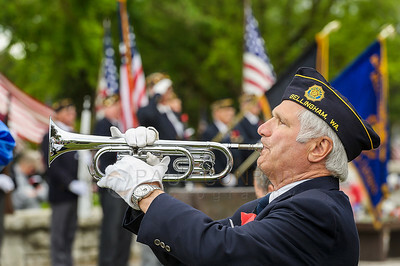 © Paul Conrad/The Bellingham Herald - American Legion Post 7 stand at parade rest while taps is played during the 50th annual Festival of Flags and Remembrance Ceremony at Greenacres Memorial Park in Ferndale, Wash., on Monday afternoon May 25, 2015. 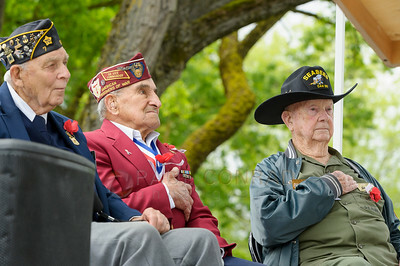 © Paul Conrad/The Bellingham Herald - (l to r) World War II veterans and honorees Carl Hamm, Joe Moser, and Walt DeKraai listen as Swil Kanim gives the keynote address during 50th annual Festival of Flags and Remembrance Ceremony at Greenacres Memorial Park in Ferndale, Wash., on Monday afternoon May 25, 2015. 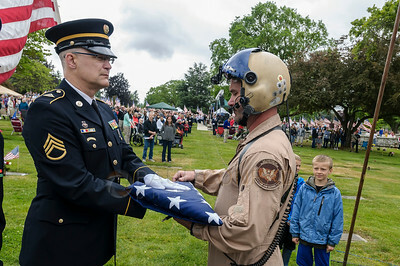 © Paul Conrad/The Bellingham Herald - A pilot from Homeland Security hands SSgt. 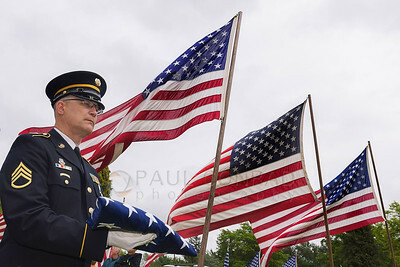 Scott Rauch of Bellingham a folded American flag during the 50th annual Festival of Flags and Rememberance Ceremony at Greenacres Memorial Park in Ferndale, Wash., on Monday afternoon May 25, 2015. 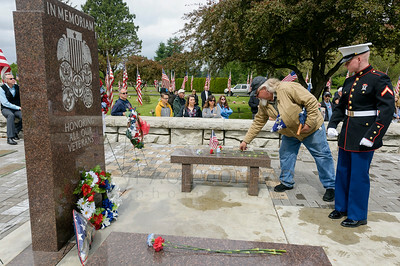 © Paul Conrad/The Bellingham Herald - World War 2 veterans lay wreaths at the Veteran's Memorial during the 50th annual Festival of Flags and Remembrance Ceremony at Greenacres Memorial Park in Ferndale, Wash., on Monday afternoon May 25, 2015. 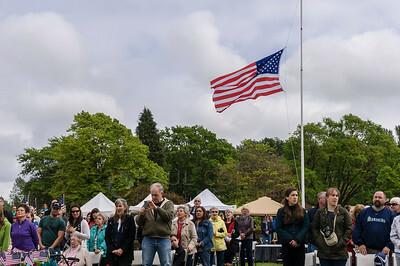 © Paul Conrad/The Bellingham Herald - The U.S. flag flies at half-staff during the 50th annual Festival of Flags and Remembrance Ceremony at Greenacres Memorial Park in Ferndale, Wash., on Monday afternoon May 25, 2015. © Paul Conrad/The Bellingham Herald - American Legion Post 7 gives a 21 gun salute during the 50th annual Festival of Flags and Remembrance Ceremony at Greenacres Memorial Park in Ferndale, Wash., on Monday afternoon May 25, 2015.